There are hundreds of pop up stand varieties to choose from; each one different to the last. We stock a comprehensive range of pop up displays, and sometimes the amount of variety can seem daunting. With exhibitions and events bringing so much potential value to your business, it is essential that you perfect your display stand. If you pick the wrong exhibition display, you are falling down at the first hurdle and investing in a product that might not get you the results you want and need. What is the event I am attending? What type of pop up stand you invest in will depend on the type of event you are going to. For example, a large exhibition event with a high footfall would increase the pressure on you to make your display stand out. For this reason, a linked pop up display stand is a superb choice because of the large size and increased graphic area. Linked pop ups are also reconfigurable, meaning you can maximise your investment by adding a linking panel and creating a bespoke display. A jumbo pop up exhibition stand would also be an excellent choice. They are among the tallest marketing solutions available and are especially useful for creating a multidimensional display. Jumbo’s can be used to link two or more regular pop up displays together; resulting in a unique display solution that is guaranteed to get your brand noticed and enhance your exposure. A smaller business conference may require a slightly different approach in terms of your display stand. A jumbo may not be the best option, but a straight pop up display stand or a curved pop up exhibition stand might be the better option. 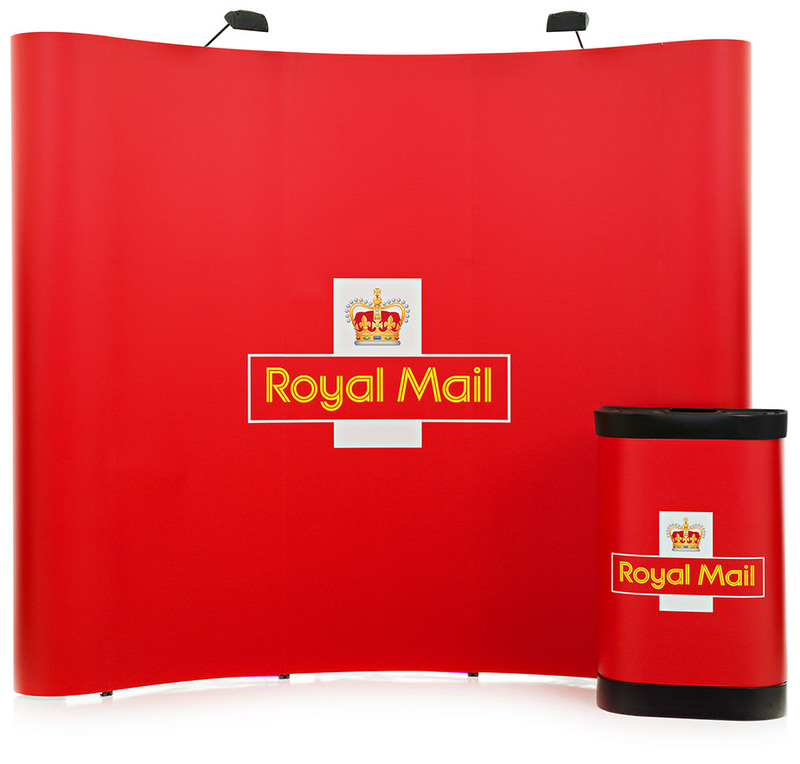 Our bestselling pop up display stand is the 3x3 curved pop up stand bundle. The 3x3 is a good size as it fits neatly into most exhibition spaces. It provides a favourable amount of graphic design space and can even have double sided graphics, further enhancing your brand’s reach without taking up vast amounts of space. Pop ups are mostly used for temporary events over the space of a few days. However; fabric pop up exhibition stands are suited to more rigorous use because of their durability. Fabric displays are printed using a dye-sublimation process during which ink is fused into the weave of fabric using heat and pressure. This results in hardwearing graphics that are not only strong and reliable, but they are also ultra-vibrant and high definition. There is no show through or reflection on fabric displays, making them especially popular for photographers. Fabric exhibition stands are popular for use within photography studios, but they are also a common choice for a backdrop at events and award ceremonies. What space am I exhibiting in? As every event is different, every space is different. Shell scheme booths are extremely common at exhibitions. A shell scheme space basically means that you have a set booth with walls to separate your space from another brand’s. You can have a shell scheme space with either two or three walls, meaning you have multiple large, flat spaces to cover. The easiest and arguably the sleekest way to do this is with a linked pop up display stand. Linked pop up stands are reconfigurable, modular exhibition solutions that can adapt and grow alongside your business. 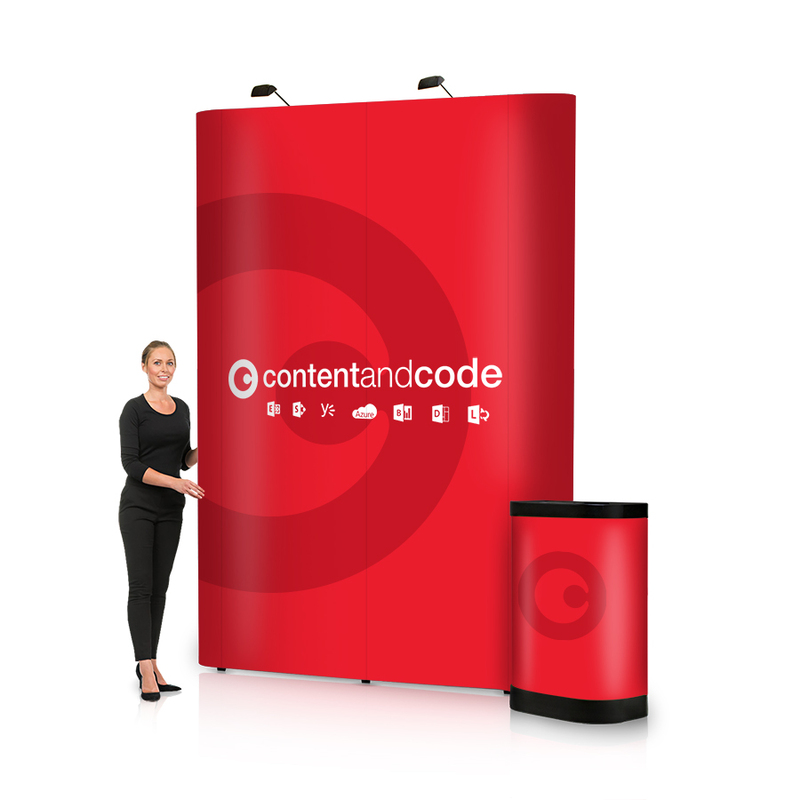 For example, if you are exhibiting in a shell scheme with two open sides, an L-shaped linked pop up will provide you with effective brand awareness without taking up too much of your limited floor space. If you want to use the same stand at a different event but your new shell scheme has three walls to cover instead of two, you can simply purchase a linking kit and reconfigure your existing pop up display to become a U-shaped linked pop up exhibition stand. If you’re not exhibiting in a shell scheme area, then you more than likely will have a floor-only space. Double-sided pop up exhibition stands or island pop up display stands work exceptionally well in floor-only areas. Double-sided pop up displays provide your brand with 360-degree brand promotion for visibility in high footfall areas where you might otherwise struggle to attract attention from all directions. Island pop up display stands work in a similar way to double-sided pop ups in the sense that they give you the opportunity to get noticed from all angles. Island display stands are especially popular for brands who are wanting to advertise several products or areas of service at once because they allow you to separate one product from another. Potentially the largest factor to consider when investing in a pop up exhibition stand is how much you are willing to spend. Exhibiting is a costly affair at the best of times, so most businesses will try their best to keep costs down as much as possible in order to save as much of their marketing budget as possible. Here at XL Displays, we do our utmost best to help you get as much for your money as possible. Bespoke pop up exhibition stands are never going to be the cheapest option, but that doesn’t mean that you can’t have something equally as high impact on a stricter budget. We manufacture complete exhibition kits from as little as £355.00. 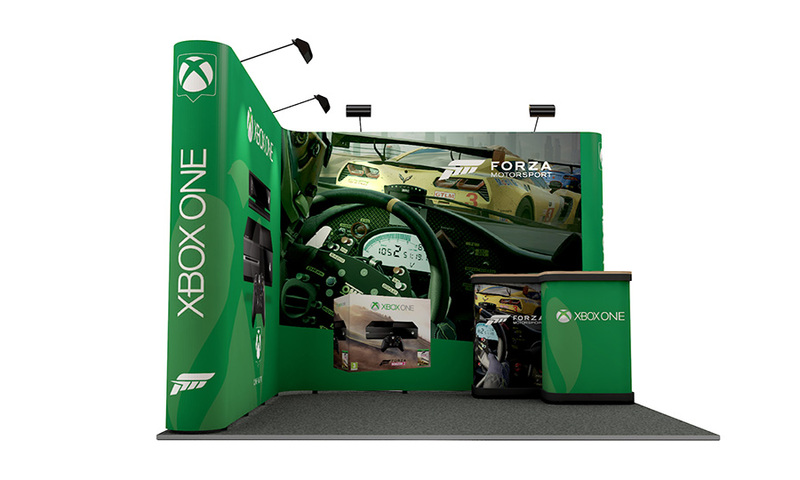 These kits include a complete pop up display stand with graphics, a Zeus2 case with a graphic wrap and beech top and a set of pop up LED lights. A Zeus2 case is a hard plastic transport case that transforms into a promotional counter by adding the graphic wrap and beech top. We are the only pop up display stand supplier to include LED lighting kits as standard with all of our pop up stand bundles. Most suppliers offer halogen lights, but our LED lights require less power consumption whilst providing you with the same great light output. All this makes our pop up exhibition stand bundles a popular choice, but for businesses with a slightly larger budget, we offer larger linked pop up stands from just £725.00. Like with the smaller bundles, the linked pop up display kits come with LED lighting, a Zeus2 case with graphic wrap and beech top and the complete display stand as standard. If you can answer these core questions, selecting the right pop up exhibition stand will become a lot easier. If you need any more help or guidance on buying a pop up stand, don’t hesitate to contact our dedicated sales team on 01733 511030.